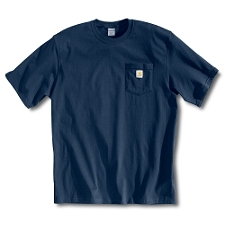 Our short sleeve workwear pocket t-shirt is an all-purpose work shirt that is perfect in warm weather or for layering when it gets cold. Its made of 6.75-ounce, 100% cotton jersey knit and features a rib-knit collar and a left chest pocket. Its also been designed with side-seamed construction to minimize twisting and maximize comfort. Ash fiber content is 99% cotton / 1% polyester. Heather Gray fiber content is 90% cotton / 10% polyester.